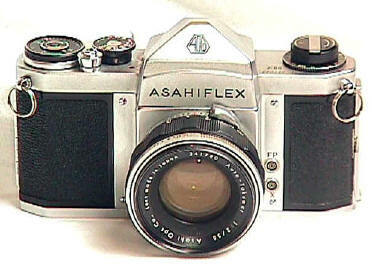 This is an Asahiflex ? 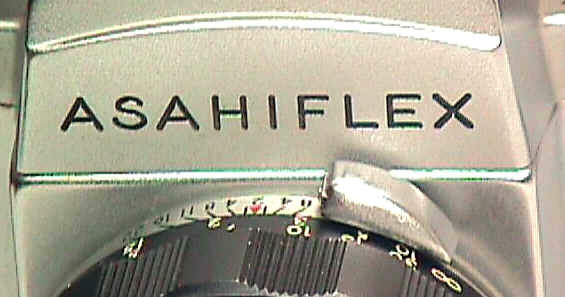 Just about any classic camera collector will tell you that no Asahiflex had a pentaprism and they never had a standard 42mm Pentax screw mount. Well, some of them did. Behold a renamed Pentax H2 aka S2, circa 1959, complete with semi-automatic 50/2 Auto Takumar. You had to open the lens aperture by pushing that chrome knob on the lens. It would then shut down automatically with the exposure. See profile on its older brother, the Original Pentax of 1957. I was frankly shocked when I found this guy. After emails to Fred Sherfy, I found out it was made for the South African market to circumvent a trademark problem with Pentacon, and also sold through the PX to American servicemen in Libyan and Spanish American military bases. It was also marked the "Penta Asahiflex." Both versions are extremely hard to find. The H2 is very similar in shape to the Original Pentax, except that it has a single shutter speed dial and the semi-automatic diaphragm -- rather than separate high and low shutter dials and a manual diaphragm.